Webinars are virtual meetings that allow us to introduce the science behind upcoming expeditions and the associated Education Expedition Module, lesson plans, and classroom resources to enable teachers and students to participate in the expedition online. 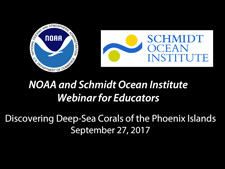 NOAA's Office of Ocean Exploration and Research and Schmidt Ocean Institute invite educators to a webinar to introduce the science and associated educational resources available for the 2017 Discovering Deep-sea Corals of the Phoenix Islands expedition, October 5 - November 1. 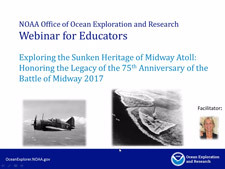 The National Oceanic and Atmospheric Administration's (NOAA's) Office of Ocean Exploration and Research invites formal and informal educators to participate in a webinar to introduce the spring ocean exploration mission to Explore the Sunken Heritage of Midway Atoll in Hawaii. 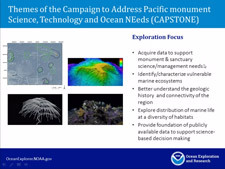 The National Oceanic and Atmospheric Administration's (NOAA's) Office of Ocean Exploration and Research invites educators and other interested parties to a webinar to introduce the educational resources developed for the upcoming 2017 Mountains in the Deep: Exploring the Central Pacific Basin Expedition on the NOAA Ship Okeanos Explorer. 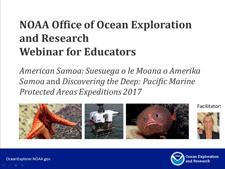 The National Oceanic and Atmospheric Administration's (NOAA's) Office of Ocean Exploration and Research invites educators and other interested parties to a webinar to introduce the educational resources developed for the upcoming 2017 American Samoa and Remote Pacific Marine Protected Areas Expeditions in the western Pacific Ocean on NOAA Ship Okeanos Explorer. 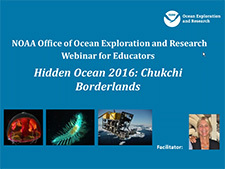 NOAA's Office of Ocean Exploration and Research invites educators and other interested parties to a webinar to introduce educational resources developed for the upcoming 2016 Chukchi Borderlands Expedition. 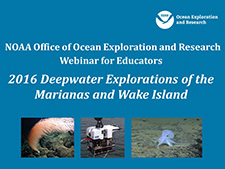 NOAA's Office of Ocean Exploration and Research invites educators and other interested parties to a webinar to introduce educational resources developed for the upcoming 2016 Deepwater Exploration of the Marianas on NOAA Ship Okeanos Explorer. 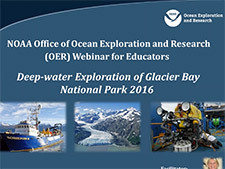 NOAA’s Office of Ocean Exploration and Research invites formal and informal educators to participate in a webinar to introduce the March ocean exploration mission to explore the unknown depths of the fjords of the Glacier Bay National Park. 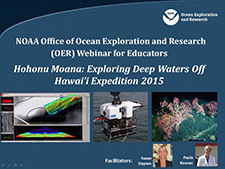 The National Oceanic and Atmospheric Administration's (NOAA's) Office of Ocean Exploration and Research invites educators and other interested parties to a webinar to introduce educational resources developed for the upcoming 2016 Hohonu Moana Expedition on the NOAA Ship Okeanos Explorer. This cruise will continue the 2015 Hohonu Moana Expedition’s exploration of deep-water habitats in and around Papahanaumokuakea Marine National Monument (PMNM) and will include work on seamounts in the Mid-Pacific Ocean while en route to port in Kwajalein. 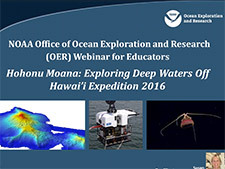 The NOAA Office of Ocean Exploration and Research (OER) invites educators and other interested parties to a webinar to introduce educational resources developed for the upcoming Hohonu Moana Expedition in and around the Hawaiian Island Marine National Monuments and National Marine Sanctuaries. Join the NOAA Office of Ocean Exploration and Research for a webinar for educators introducing educational resources developed for an ocean exploration mission to explore the intriguing topic of bioluminescence in the depths of the Gulf of Mexico. 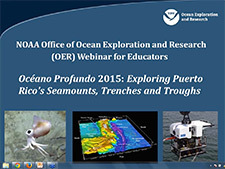 The NOAA Office of Ocean Exploration and Research invites formal and informal educators to participate in a webinar to introduce educational resources developed for an ocean exploration mission to explore seamounts and troughs around Puerto Rico and the Puerto Rico Trench. The NOAA Office of Ocean Exploration and Research (OER) invites educators to participate in a webinar about the Submarine Ring of Fire 2014 Expedition taking place November 29 - December 21, 2014. 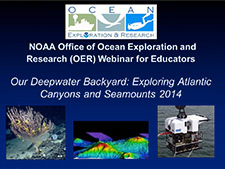 The NOAA Office of Ocean Exploration and Research invites formal and informal educators to participate in a webinar to introduce educational resources developed for an ocean exploration mission to explore seamounts and submarine canyons off the Northeast U.S. coast. The NOAA Office of Ocean Exploration and Research invites formal and informal educators to participate in a webinar to introduce educational resources developed for an ocean exploration mission to search for the Lost Fleet of 1565, off the coast of Florida. 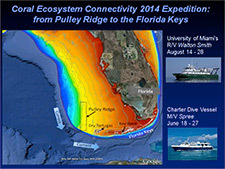 The NOAA Office of Ocean Exploration and Research invites formal and informal educators to participate in a webinar to introduce educational resources developed for an ocean exploration mission to the coral reef ecosystems off of southwest Florida. NOAA's Office of Ocean Exploration and Research invites formal and informal educators to participate in a webinar to introduce educational resources developed for an ocean exploration mission to the coral reef ecosystems off of southwest Florida. NOAA’s Office of Ocean Exploration and Research invites formal and informal educators to participate in a webinar to introduce educational resources developed for an ocean exploration mission to the Northeast U.S. Canyons aboard the NOAA Ship Okeanos Explorer. NOAA's Office of Ocean Exploration and Research invites formal and informal educators to participate in a webinar to introduce educational resources developed for an ocean exploration mission to deepwater canyons off the mid-Atlantic coast aboard the NOAA Ship Ron Brown.